Martinsville has its hot dogs. Road America has its brats. Texas Motor Speedway just keeps trying to kill us. And the Nürburgring (as well as most of Germany) has glorious, glorious currywurst. It is my solemn duty to you, the reader, to eat this currywurst. 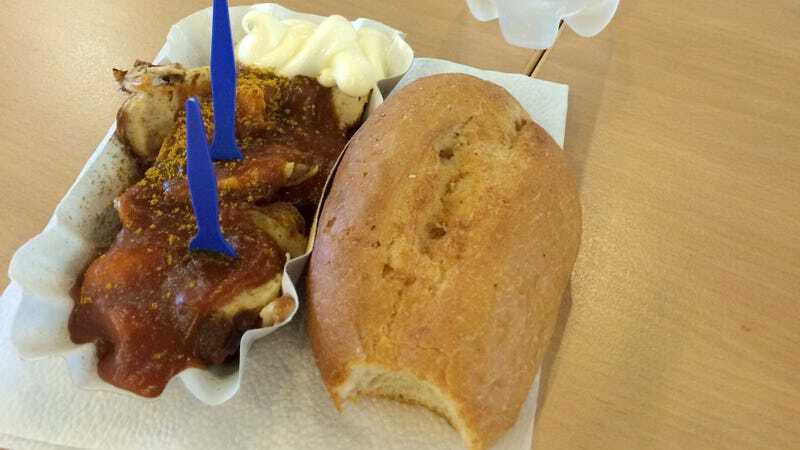 As tested: currywurst mit brot (with bread) and extra mayonnaise (because why not? ), with Gerolsteiner Sprudel (bubbly). Purchased at a stand right next to the end of the garages. Holy crap. Holy crapping crap. This is some of the tastiest track food I’ve had in a long, long time. Currywurst is pretty simple: take a pork sausage, cover it in curry ketchup, sprinkle curry powder on top, and boom: snack. Serve with either fries or bread. The bread was really the weakest link here. I might do fries if I try this again. It served the purpose of sopping up extra curry ketchup (which is spicy, wonderful and worth licking from the little paper sausage-boat in its own right), but it was kind of tough. I was glad I got the extra mayo to swirl together in a curry ketchup-mayonnaise dipstravaganza for the bread, to be honest. It needed the extra sauce. The only problem was, erm. Well. I felt full afterwards, but not full of food. Full of gas. I don’t think it was the sparkling water. Gerolsteiner lacks the “is this actual bits of soil?” aftertaste of Topo Chico, so I tend to have it at home. If anything, it just makes me belch. I’d eaten the goulash in the media room for lunch (also delicious) and snacked around on a couple little pastries and things, but for the most part, I hadn’t eaten a ton. I didn’t feel like a walking fart balloon until after the currywurst. The upside? Well, it stayed bottled up in there for a good, long time. I don’t think I really unleashed the kraken until well after dinner. My flight home was the next day. Fortunately, the flight out of Düsseldorf was surprisingly empty, and I had the entire row to myself to let air pressure help the rest of the currywurst’s effects go on their merry way. Worth it? Pffffttttyeeeeah. When at the ‘ring, you must eat the currywurst. It is delicious. You will crop-dust the entire Eifel the following day, but should you care? No. Because you’re all eating currywurst, and it’s well worth the farts.